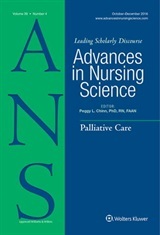 Advances in Nursing Science, along with a host of other scholarly journals world-wide, standing for the crucial activities of science that establish what we can rely on as fact, and based on that assurance, shape wise action. But there is a now a political and cultural wave of mis-information that serves to discredit science, and to sow seeds of doubt that undermines the value of scientific credibility. In my Editorial that appears in the current issue of ANS, I address this challenge and implore all ANS readers to engage in actions to do what is needed to stand for science in all aspects of your professional and personal life. There are two levels that I address in this editorial – the first is the substantive practices of ANS that assure readers of the credibility and authenticity of the content we publish in the journal. In particular, we provide clear descriptions of all of our editorial practices in the “Information for Authors,” we hold membership in COPE (Committee on Publication Ethics), and we adhere to these standards and practices. Be aware of the best editorial practices of nursing journals that ensure the integrity of their content. Learn and practice “journal due diligence” when you are seeking a journal for publication of your work. Ensure that your practices as a scholar are well founded and maintain a record of your practices to ensure that your work is not compromised. Educate others (your patients, students, and colleagues) about your own practices to ensure the integrity of your own work and why these practices are important. Network with other scholars in your area of interest to ensure that you have a community of those who share your intent to maintain the integrity of the scholarship in your field, and who can speak with confidence about the foundation on which your work is based. This editorial is available on the ANS website at no cost while this issue is the current issue! Visit the website now to download your copy. Cut and paste or post the list of things to do where you can be reminded every day of how crucial our actions are in this time of challenge!